City Foundry STL is pleased to announce the addition of two office tenants to its roster of signed leases. Digital publishing and technology firm Multiply and DNA technology company Orion Genomics have recently executed leases to move their operations to City Foundry. The two companies will occupy 30,000 square feet and add almost 100 employees to the development. Multiply invests in and operates premium digital publications by leveraging its proprietary technology, publishing, and analytics platform. Proudly based in St. Louis, Multiply connects the Interested with the Interesting. Orion Genomics, an award-winning biotechnology company based in St. Louis, Missouri, brings together cutting edge scientific expertise, innovation, proprietary technologies and research partnerships throughout the globe to change how the world approaches feeding, fuelling and healing itself. Orion has expanded globally with strategic partnerships and collaborations in the United States, Europe and Asia and operates subsidiary companies in Kuala Lumpur Malaysia and Jakarta Indonesia. 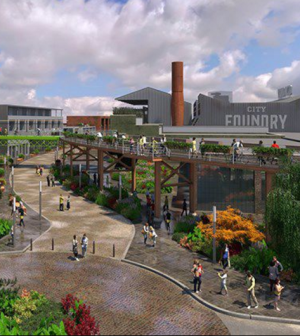 City Foundry STL is the adaptive reuse of the former 15-acre Century Electric Foundry complex in St. Louis’ growing Midtown neighborhood. The iconic and historically significant foundry building will be transformed into a dynamic hub of innovation complete with St. Louis’ first true food hall. The $187 million first phase will include 122,000 square feet of restaurant and entertainment; 105,000 square feet of shops, and 111,000 square feet of office space. The project is being designed and developed by Lawrence Group.